Overworking your hands in knitting, crafting or other activities like computer work? Join us for a gentle, fluid class that will stretch and open up your joints from shoulders through elbows into fingertips. This seated class is suitable for all ages and fitness levels and will provide an experience to take with you for continued ease in all the activities that can overwork your hands. Join us on Saturday, August 18th from 11 am to 1 pm at Chatham Real Food Market, 2nd floor. Cost is $20.00. Register for the class by calling or stopping by the store or click here to be taken directly to the registration form. Alexandra Berger has been teaching Gyrokenesis® and Gyrotonics® since 2007 and dancing since the age of 3. She is a member of the Dusan Tynek Dance Theatre(who will be performing at PS21 on August 17th and 18th) and Douglas Dunn & Dancers, among others. Her approach is to improve general health and well-being through movement. Her classes are healing and de-stressing rather than a workout. Gyrokenesis® is a holistic approach to movement through gentle exercises based on the practice of yoga. It is suitable for all ages and fitness levels. Join us on Saturday, June 16th to meet local dyer, Teri Bartosik, aka Whole Knit 'n Caboodle Yarns. She will be at The Warm Ewe to help you pick your yarns for our summer knit-along, the On the Spice Market shawl by Melanie Berg. The kit for the knit-along includes the pattern, notes from Teri, a hank of her lovely Bam Woo Light yarn (35% Bamboo and 65% Merino), mini skeins in 6 different colors and custom stitch markers from Knitting Accessories (designed by Teri's sister). Unlike other kits, you get to customize the 6 contrast colors to make your shawl unique and you will have enough yarn leftover from the mini skeins to also make a striped cowl. So two kits in one! Come pick out your mini skein colors with Teri on the 16th. If you can't make it on the 16th, the mini skeins will be at The Warm Ewe so orders for your customized kit can be placed by June 18th. We will start the knit-along on Saturday, June 30th. "Calling all knitters, crocheters, weavers, spinners and general crafters! We know yarn stimulates your senses, from feeling the fibers to seeing the variety of colors, but you have to be in the store to experience it. This is your chance to celebrate everything you love about yarn and help others enjoy those same experiences. Teach a friend to knit and bring them to your local yarn shop on April 21! Share your passion for the craft and your favorite yarn store on social media." As your local yarn store, we truly appreciate your support, especially at a time when many local yarn stores are closing. We all know there's nothing like the experience of walking into a yarn shop - it's a feast for the senses! You can see the beautiful colors, feel the different textures, get help and advice, and learn new techniques. Local Yarn Store Day is a day to celebrate and share your yarn store love! Come. Bring a friend! Teach a friend to knit or encourage them to sign up for a knitting lesson! - A raffle for a set of FlexiFlip needles - these are all the rage and we managed to get our hands on 2 sets. Stop in to fill out your raffle ticket! - A yarn tasting from Classic Elite - sign up here to reserve your spot (we have limited space) to try out 5 of CEY's yarns. If you decide on a project with one of these yarns, we give you 10% off your purchase! - Trunk shows from Berroco and Classic Elite to inspire your spring/summer knitting. - Purchase any of the Knitting Fever or EuroYarn brands and receive a coupon for a free pattern download. - In appreciation of your support, all Clearance yarns will be 50% off the original price on Local Yarn Store Day. The clearance shelves are full to overflowing so we could free up shelf space for the newly arrived yarns. Be sure to take advantage of these bargains! - Choose from a selection of free patterns, books and magazines with any purchase (limited to one per customer). - And enjoy some refreshments! Come see why people voted The Warm Ewe the Hudson Valley's Best Yarn Store for 2017! A Great Selection of Yarns, Patterns and Magazines at 50% OFF! Percent discounts are off original prices. We cannot accept any sale purchases for exchange, return or store credit. No returns will be accepted during the sale. You may use your store credits and gift certificates! Wooly Spruce Farmstead yarns, special orders & holds are not included in the sale. 1. Please bring any RETURNS back before the sale and get store credit. Then you can use your store credit for sale merchandise. NO returns will be accepted during the sale. You can also use your gift certificates on sale items, so bring those in! 2. If you have a project you will need help with, please come in ahead of time. That way we can spend time with you figuring out the amount of yarn you'll need and in the color you want. Make notes! It's also a great idea to come in ahead of the sale and spend a little time just browsing around the shop. Get ideas and inspiration, touch and feel. There's a lot here to take in! 4. We won't be able to wind yarn for you during the sale, but if you would like to come in after the sale, we will be happy to wind it for you at a time when we are not busy. Also, since the sale gets very busy, we ask that you please save knitting/crochet problems and requests for help until after the sale when we will have more time to help you. 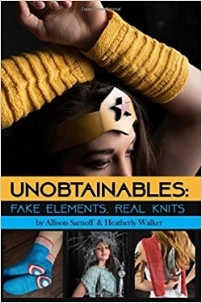 JOIN US AT THE WARM EWE SATURDAY, DECEMBER 9TH FROM 1:30 TO 3:30, WHEN LOCAL KNITWEAR DESIGNER, ALLISON SARNOFF, WILL BE SIGNING UNOBTAINABLE: FAKE ELEMENTS, REAL KNITS, THE BOOK SHE CO-WROTE WITH HEATHERLY WALKER. THE PATTERNS ARE FOR NERDS, ACCORDING TO THE FOREWORD, BUT THEY ARE BEAUTIFUL AND INTERESTING FOR NON-GEEKS , TOO. ALL ARE BASED ON FICTIONAL ELEMENTS THAT APPEAR IN DR. WHO, FLASH GORDON, STAR TREK, AND STAR WARS, AMONG OTHERS. THERE ARE 25 PATTERNS IN ALL, INCLUDING SOCKS, SHAWLS, SCARVES, MITTS AND CUFFS. FIVE OF THE PATTERNS USE YARNS FROM THE PERIWINKLE SHEEP. YOU WILL CERTAINLY WANT A COPY FOR YOUR KNITTING LIBRARY! TO BE SURE THAT WE HAVE ENOUGH BOOKS ON HAND, WE ASK THAT YOU SIGN UP BY CLICKING HERE. FEEL FREE TO STOP BY THE SHOP AHEAD OF TIME TO CHECK OUT THE BOOK! World Wide Knit In Public Day is a great opportunity to come out and knit in community with your neighbors and friends. Come join us at the Gazebo at the corner of Park Row and Main Street, Chatham, NY from 2-5 pm as we take part in this worldwide event celebrating knitting and crochet. Bring your project and a lawn chair. Refreshments will be served! This is also the kickoff for our first knitalong of the summer. We'll be knitting the A Maze 'n' Miters sweater from Knitter's magazine. This fun project boasts several different techniques, including miters and stripes, and an unusual construction to keep you interested throughout. We'll be ordering copies of the magazine for anyone interested. You can also order your own copy from knittinguniverse.com in either print or digital format. Stop by the shop to let us know you're interested and to check out yarn choices. Tell all your friends...maybe even bring someone you know that would like to learn to knit! We hope to see you there! Want to knit a cardigan where gauge doesn't matter and there is no finishing? Join us for the Fll 2016 Knit-along! Join us on Saturday, July 23rd and Sunday July 24th as The Warm Ewe hosts a pop-up shop from Stitched by Jessalu. Anne and Tempe first saw these wonderful project totes and notion bags at the MA Sheep and Wool Show in Cummington, MA and are happy to provide a testimonial. These bags are beautifully sewn by Jessica at home in nearby Egremont, MA, in interesting and fun fabrics - classic, funky, geometric, floral, geeky or literary (Dr. Who or Jane Austen anyone?). Each bag has a different print lining the inside and is elegantly finished with a zipper and a zipper pull made of Swarovski crystals and a silver bee. Interested in learning more about Stitched by Jessalu? You can check out her website atstitchedbyjessalu.com. See you this weekend! If you love the Hudson Valley and knitting, crochet or any fiber art, you’re invited to hop aboard the 2016 Hudson Valley Yarn Shop Cruise! This event is a self-guided tour of the yarn shops in the Hudson Valley. Beginning on Saturday, June 18, World Wide Knit in Public Day, and ending Monday, September 5, Labor Day, you’ll have the opportunity to experience the unique qualities that make each shop and its town beautiful. We at The Warm Ewe hope you'll join us for our kick off event on World Wide Knit in Public Day, at the gazebo on the corner of Park Row and Main St, here in Chatham, NY from 2-5 pm. Bring a chair and your knitting or crochet and join your friends and neighbors for community knitting in the great outdoors! Refreshments will be served. Start your yarn cruise by visiting The Warm Ewe (or any other shop on the Trail) to purchase this year’s beautiful tote bag. Inside you’ll find all you need to participate in the events at each shop and be eligible for prize drawings after Labor Day. The cruise ends with a real cruise down the Hudson aboard the Pride of the Hudson on September 18. Be sure to check out our newsletter, Facebook page and Ravelry group (Friends of the Warm Ewe) for event announcements throughout the cruise! For more details, and an interactive map of all the shops on the cruise, check out the website, hudsonvalleyyarnshoptrail.com. Look on Facebook for The Warm Ewe and the Hudson Valley Yarn Shop Cruise. Post your purchases, prizes, and projects on The Warm Ewe Facebook page as well as the Friends of the Warm Ewe and Hudson Valley Yarn Cruise Ravelry groups and on Instagram using #HVYarnCruise.